A lot has been written about the effectiveness of print marketing versus digital marketing - so much so, that we're not going to get into it here. It's safe to say that both have their fair share of advantages and when used effectively, can compliment one another very nicely. There is one major benefit that print marketers have that their digital brethren don't share - the paper itself. People like to feel something in their fingers when they read it or consume it. One of the biggest contributors of that phenomenon is paper coating. Knowing how it affects what you're trying to accomplish is one of the keys to making the best possible paper decisions moving forward. We've already covered paper stock, along with how that stock affects someone's initial impression of a piece of marketing collateral. Making an effort to select the right type of stock can have a significant affect on the way someone experiences your marketing materials for the first time. Another contributing factor, however, is the coating - or the lack thereof. When paper is coated, it's treated with a compound or polymer to make sure that the finished product has certain qualities that weren't initially present. Paper can be used to give your flyer a subtle sheen or surface gloss, for example, or it can even take a thinner piece of paper and make it feel thicker in someone's hands. It can be used to make a rougher piece of paper feel smooth, or even reduce the way that ink is absorbed when someone runs their fingers across it. 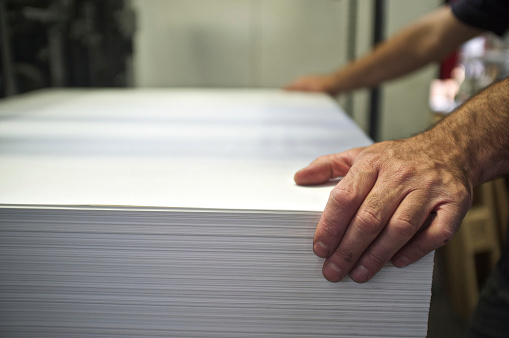 The coating is introduced onto paper stock using an offset press through a process that varies depending on exactly what type of coating you're talking about. Semi-gloss coating, for example, is often called "UV" coating because the paper itself is coated with a high gloss under intense UV lights. To continue with the "house paint" analogy, glossy paper would be like semi-gloss paint. It introduces a beautiful sheen into the finished product, but it isn't necessarily super shiny like a mirror. If you've ever seen a piece of paper that was very, very shiny, you were looking at a piece of coated paper. This is commonly referred to as C2S paper, which is short for "coated (on) 2 sides." In the end, paper coating requires you to add a new dimension to your thinking concerning your print marketing collateral. You can't just think about the impression you make when someone sees your next flyer or brochure - you need to think about the impression you give off when they feel it, too. Do you want something super shiny, or would something with a more traditional sheen do? The answer, as always, will depend on exactly what it is you're trying to accomplish.